I’m excited to announce today a preview of the Open Service Broker for Azure (OSBA), an implementation of the Open Service Broker API for Azure services. In a multi-cloud, multi-platform world, developers want a standard way to connect their applications to the wealth of services available in the marketplace. The Open Service Broker API is an industry-wide effort to meet that demand, simply and securely. OSBA is the simplest, most flexible way to connect your applications to a suite of the most popular Azure services, from standard offerings like Azure Database for MySQL to unique Azure solutions like Azure Cosmos DB, our globally distributed multi-model database. We currently offer 11 Azure services and intend to support most others over the next year. 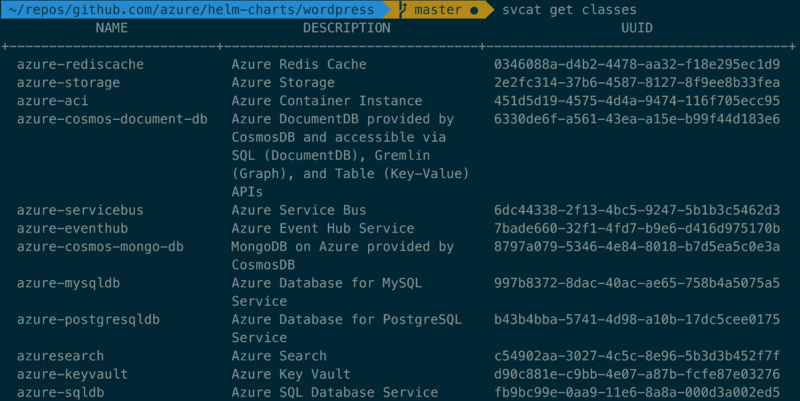 The Open Service Broker for Azure and the service catalog CLI make it easy to connect your Kubernetes applications to Azure services. Open Service Broker for Azure can be deployed to any OSB-compatible platform running in any environment. Whether you’re using Kubernetes, Cloud Foundry, or OpenShift in Azure, Azure Stack, your own on-prem environment (or somewhere else) you can take advantage of all the great services that Azure has to offer. Microsoft has a long track record of innovation in this space that goes back to our service broker investments for Cloud Foundry in 2016, and of doing so in the open. OSBA builds upon this work and extends it to new platforms and services, while showing our commitment to the Open Service Broker API. Because of today’s announcement, we plan to supersede the meta-azure-service-broker project in favor of OSBA and will work closely with our Cloud Foundry customers to ensure a smooth migration. As part of our broader investments on Kubernetes, Microsoft has been an active contributor to the Service Catalog, which enables Kubernetes operators to leverage cloud-native services provided by platforms like Azure. Today, we are also announcing the alpha release of a CLI for the Kubernetes service catalog. This tool allows interaction with well-defined service catalog objects like brokers, service instances, and service bindings, making interacting with the service catalog considerably simpler. The service catalog CLI will work with the service catalog no matter where it is deployed, and we look forward to collaborating on it with the rest of the Kubernetes community. The demo below shows how easy it is to use OSBA to provision and bind Azure Services for some of the supported environments. Note that for Kubernetes this includes natural integration with the Helm package manager and the use of the new service catalog CLI. You can get started building Azure-powered applications with OSBA today. We have instructions for deploying on Kubernetes and Cloud Foundry, with OpenShift and Azure Service Fabric coming soon. If you are targeting Kubernetes, be sure to check out our Helm charts where you can see examples of popular Helm charts like WordPress and Concourse which have been enhanced to use Azure services provisioned by OSBA. Thanks, and we’ll see you on GitHub!